You're ready to start the band, but first, that art school buddy of yours needs a bass. (This is how The Beatles started, by the way.) Look no further than Dean's Playmate Bass and Amp Pack. With Dean's new Playmate Bass and Amp Pack, that budding bassist has all he or she needs to get rocking. 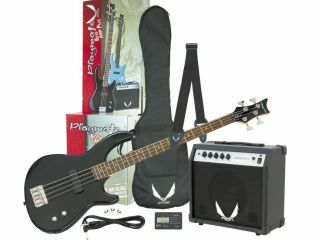 Included are a Dean Playmate Edge 09 Bass Guitar, Dean Bassola 10 Bass Amp, gig bag, tuner, cord, and strap. And hey, they even throw in some picks. The Dean Playmate Edge 09 bass is a sharp-looking and playable instrument with a basswood body, maple neck, 22-fret rosewood fretboard with abalone dot inlays, single soapbar pickup, chrome hardware, and die-cast tuners. All for the friendly price of $360 US list. For mnore information, visit the official Dean Guitars website.